Szmidt and Kacprzyk (Lecture Notes in Artificial Intelligence 3070:388–393, 2004a) introduced a similarity measure, which takes into account not only a pure distance between intuitionistic fuzzy sets but also examines if the compared values are more similar or more dissimilar to each other. By analyzing this similarity measure, we find it somewhat inconvenient in some cases, and thus we develop a new similarity measure between intuitionistic fuzzy sets. 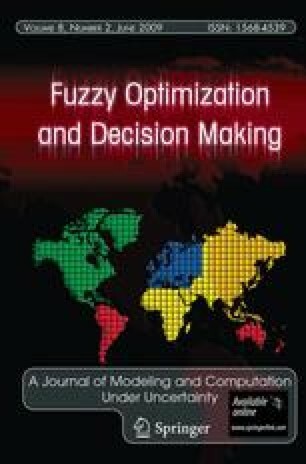 Then we apply the developed similarity measure for consensus analysis in group decision making based on intuitionistic fuzzy preference relations, and finally further extend it to the interval-valued intuitionistic fuzzy set theory.